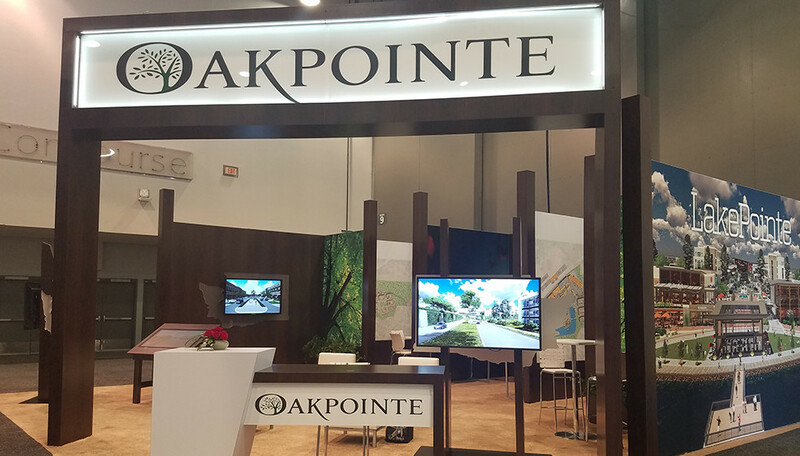 To engage potential retailers for its new master planned community in Southeast Seattle, the land and commercial development professionals at Oakpointe needed an inaugural booth to tell the story at RECon, the Global Retail Real Estate Convention, organized by ICSC. Freeman and Oakpointe collaborated on several design concepts to showcase the builder’s foundation and “real deal” expertise while also incorporating a high-tech element to attract prospective retailers. Since the brand planned to attend multiple events of various sizes, the booth needed to accommodate different footprints. Taking cues from the brand’s Pacific Northwest locale and the launch of its new retail environment, the chosen design emulated the center by combining the brand’s traditional industry prowess with modern technology, all within an adaptable structure. The hybrid exhibit showcased Oakpointe’s building acumen and ability to integrate/apply modern technology. Attendees entered the woodsy booth through a welcoming archway designed for prominent branding since hanging signs weren’t permitted. Designers maximized the 30’ x 30’ space with two semiprivate meeting spaces, monitor stands, and custom planters. 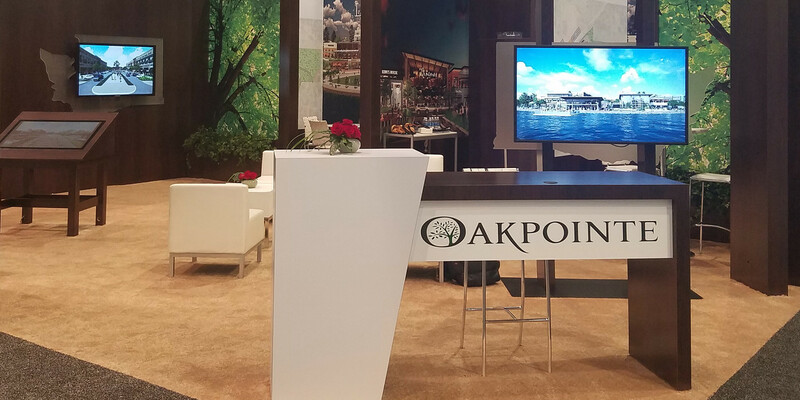 Vibrant graphics on fabric panels highlighted the brand’s multiple properties, and bespoke drafting tables with custom touchscreens invited attendees to enjoy Oakpointe content. The structure combined custom and rental elements along with our SmartPanel™ system and reusable fabric signage, accommodating numerous configurations. 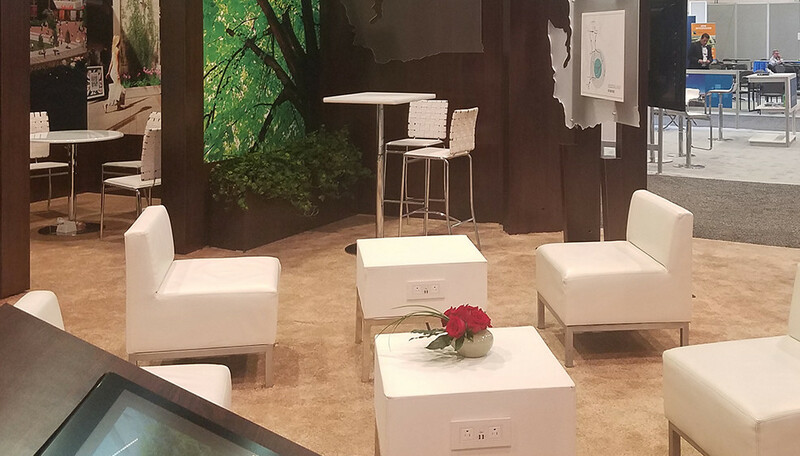 The new custom booth achieved the prominent presence Oakpointe envisioned and helped highlight its new retail center unveiling. 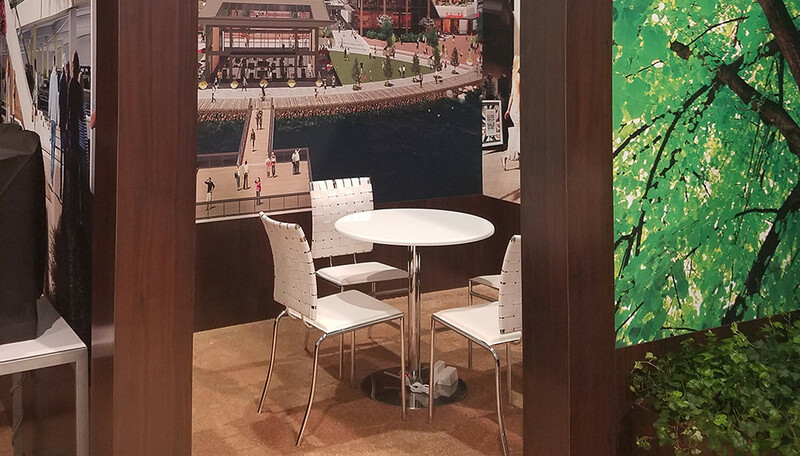 After this experience at ICSC with a new custom foundation that can change and expand, the brand believes it’s now “a player in the game.” The builder is taking this new booth on the road to Los Angeles and New York City and plans to attend next year’s RECon with an upgraded version.